I was driving back from dropping Daniel off at preschool this past week and I flipped on the radio. "Pie Jesu" was playing on the classical station. It was so beautiful. I don't normally enjoy driving very much, but in that moment with the pure sound of those amazing voices filling the car on that bright, sunny day, I found myself totally lost in the moment, enjoying every second. If there's one thing Daniel loves, it's watermelon. 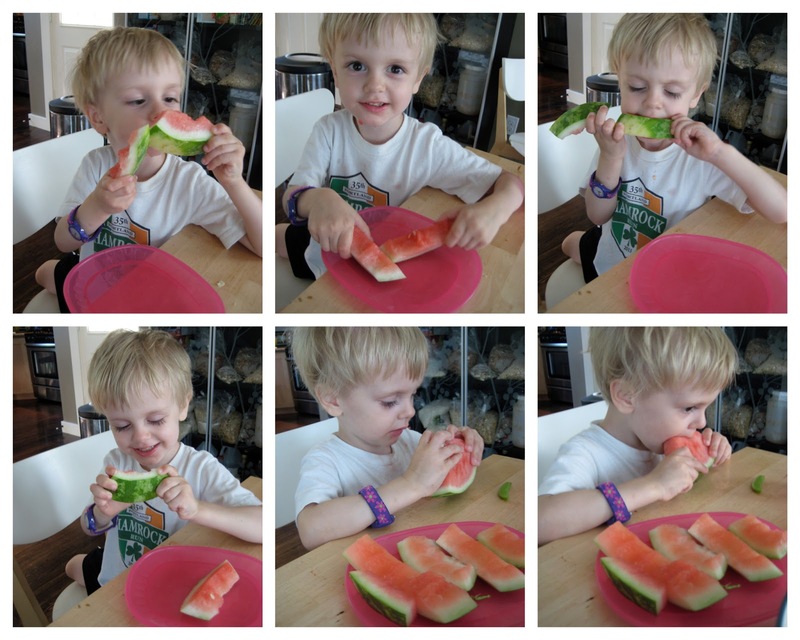 Every time he sees watermelon at a picnic or party, he's immediately drawn to it and he can hardly stop eating it to do anything else. Since it was so hot this week and watermelon is finally in season, Jaymz and I decided it was high time for Daniel to get his summer watermelon fix. Jaymz cut up the melon we got after work one evening and we all enjoyed sitting around the table feasting on the juicy, sweet fruit. Daniel practically ate his weight in watermelon, and he's been asking for more ever since. I'm sure we'll have a few more watermelon encounters before the hot days are over! We managed to go to the library twice this week, and it was closed both times. (Once was because they had summer hours that we weren't aware of, and the second time... well, I have no excuses for that one. My bad.) In any case, the second time we went to the library only to discover it was closed, Daniel and I sat down in the shade on the steps while I made a quick call to Jaymz before driving us home. As we were sitting there, Daniel laid back on the steps, looked up at the huge tree above us, and said, "Momma, I just love lying down and watching the birds." It was such a lovely reminder for me that even when our outing doesn't go as planned, there can still be wonderful moments to share. One hot afternoon this week, Daniel woke up from his nap, came into the master bedroom, and immediately flopped down on the bed next to me, sweaty and still looking tired. "Hot day, huh?" I asked him. "How about we go downstairs and get some cool drinks?" I offered. "Okay! ... Or, we could go downstairs and have a pop-sticle!" he countered. Oh yes. 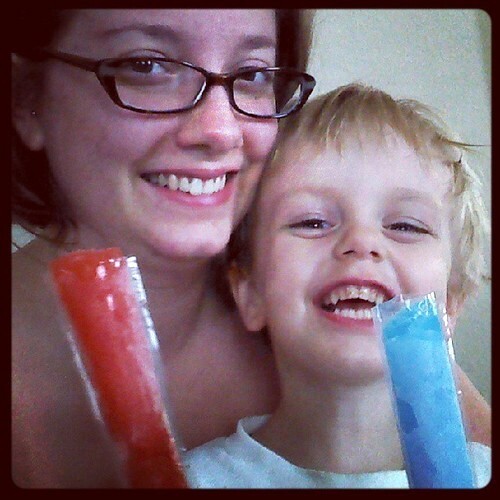 And then we did, and we relished every icy second.